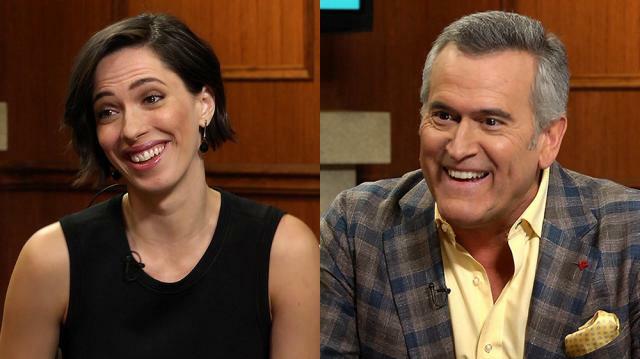 Golden Globe-nominated actress Rebecca Hall talks her highly anticipated film 'Christine' & reflects on her time working for the legendary Woody Allen. Plus, "splatstick" icon Bruce Campbell explains the decades-long success of his ‘Evil Dead’ empire. In this episode of Larry King Now, get to know two actors, both very successful but with very different careers. The first, Rebecca Hall, is known for her complex roles in films such as 'The Prestige' and Woody Allen's 'Vicky Cristina Barcelona', and the second, Bruce Campbell, has spent much of his career playing clumsy hero Ash Williams in the 'Evil Dead' horror comedy franchise and says he wears the "B movie badge" proudly. Rebecca Hall stars in 'Christine', this fall's film that tells the story of Christine Chubbuck, the news anchor who famously committed suicide on air in 1974. Hall discusses what attracted her to the role, what it was like to portray such an emotionally challenged character, and how the screenplay sought to bring depth beyond the shock value of Christine's story. Plus, she fact-checks some myths about working for Woody Allen and shares her love for her home country's favorite cooking show, The Great British Bake Off. After his conversation with Hall, Larry King sits down with Bruce Campbell, whose most recent project is reprising his role as Ash Williams in the Starz series 'Ash vs Evil Dead', which recently began its second season. Campbell reflects on the past, present, and future of 'Evil Dead', explaining the experience of the original movie trilogy, how Ash's incompetence makes him the perfect hero, and how much longer he expects to continue the franchise. Will Ash continue fighting demons until the end of Campbell's career, or will the physicality wear him out?